One of the most significant trends today in the drug delivery industry is the ascendency of the injectable market. According to information reported by Datamonitor in 2012, injectables as a whole (including those delivered by hand held devices) are becoming the single largest driver of the pharma/biotech market. At an estimated growth of +3.6% for 2011 to 2016, injectables outstrip every other drug delivery category. Thus, IMS Health has stated that by 2016, sales of injectable drugs will increase from the current $170 billion to more than $200 billion. While the growth rate for the established markets, such as North America, Europe, Japan, and Australia, is between just 1and 3%, growth in Asia and Latin America is much stronger at 12-13%. A sustained high level of growth can particularly be observed in China, India, Russia, Brazil, South Korea, Mexico, and Turkey. The reasons behind the growing demand within the pharmaceutical market, which will continue to rise in the future, are an aging population and the sharp rise in prosperity in newly industrialized countries with the associated improvements in healthcare provision, explains Ian Thompson, Vice President, Business Development at Ypsomed. The market for hand held self-injection systems is in transition and is expected to evolve over the next decade, primarily driven by three major factors, according to John Turanin, Vice President and General Manager, Zogenix Technologies. 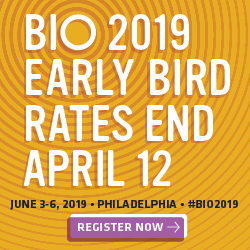 These are the increase in autoimmune disorders and the subsequent innovations in biologic drug therapies requiring injectable drug delivery; the increasing competitive mix within the biopharmaceutical industry, with the emergence of therapies, expanding pipelines, less differentiation, and the competitive threat of biosimilars; and FDA raising the bar for approvability of drug/device combination products by seeking evidence-based human factors design demonstrating usability in the intended population. “All three of these factors are converging to increase the need for drug delivery alternatives that offer real and sustainable competitive differentiation and are preferred by patients actively involved in their healthcare choices,” says Mr. Turanin. The market is also being influenced by the growth of the homecare sector. The main markets include treatments for chronic conditions such as diabetes and hormone deficiencies where repeat injections are necessary and are administered by the patient or a caregiver. “There is an increase need for safe and reliable drug delivery devices to be used in the home setting. More and more, patients want to self-administer, rather than have to travel to a physician’s office for regular injections, and payors are encouraging that more costeffective option. The aging of the Baby Boomers coupled with patients who have serious, chronic diseases, such as multiple sclerosis or rheumatoid arthritis, seek user-friendly devices that fit into their lifestyles,” says Peter Soelkner, Managing Director, Vetter Pharma International. Another key trend is an increased need for delivery systems capable of containing and delivering injectable doses of greater than 1mL, either in a single-dose rapid shot, or slowly over a longer period of time. This trend is driven by the challenges of next-generation biologics, including increased concentrations and higher viscosities. For doses below 1mL, device manufacturers have reduced device complexity while improving the patient experience, especially when dexterity or cognition can be a factor. “More than 1.3 billion 3mL insulin cartridges are manufactured each year, which is leading to a high level of demand for pen systems,” says Mr. Thompson. The market for pre-filled syringes (1mL) for drugs manufactured using biotechnology is growing, with a current annual market volume of around 300 million units. Only around 8% of these are offered in conjunction with an autoinjector, he adds. To meet the needs of both the home and professional patient care markets, Duoject offers several hand held delivery systems. Its lead hand held system, E-Z-Link, provides for the safe reconstitution of any dry form drug in a vial and diluent in any standard Luer Lock syringe. E-Z-Link is a vial socket connector with a patented protective disc to reconstitute a solid form drug using any ISO standard prefilled diluent syringe and a traditional pharmaceutical vial. The protective disc shields the end user from sharps injuries and prevents potential contamination of fluid path prior to use. This connector can be packaged separately or in a kit with drug vial and/or syringe. It is compatible with any size syringe (glass or plastic) with a luer tip and can be provided with a silicon-free stainless steel needle (for use with difficult-to-penetrate closures) or with a regular plastic spike. 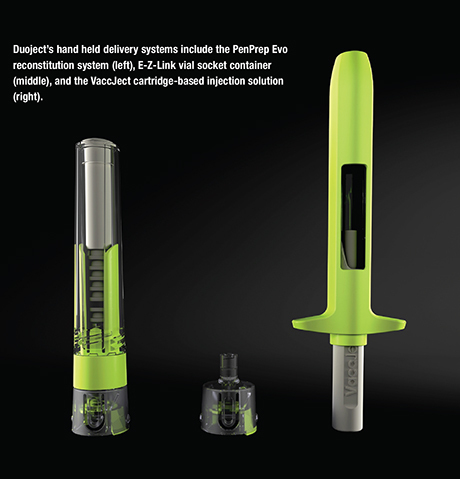 The VaccJect cartridge-based injection solution provides an alternative to a prefilled syringe, explains Mr. Williams. Fully passive needle retraction is integrated in the device; the needle is never exposed either before or after injection. The drug is contained in a standard ISO cartridge and is kept separate from the device until point of use. This reduces cold-chain shipping and storage costs and eliminates the need for secondary packaging at the pharmaceutical facility. Mr. Williams says that Duoject is currently developing a new cartridge-based autoinjector and is preparing to launch its new PenPrep Evo reconstitution system to the market in early 2014 with a major pharmaceutical partner. PenPrep Evo offers safe reconstitution between any drug vial and a 1mL or 3mL diluent cartridge. It is used with traditional pen injectors and provides the convenience of a portable discreet device for scheduled multiple self-injections. PenPrep Evo is packaged sterile and is ready for fast reconstitution and maximum recovery of dry form drugs contained in standard vials. 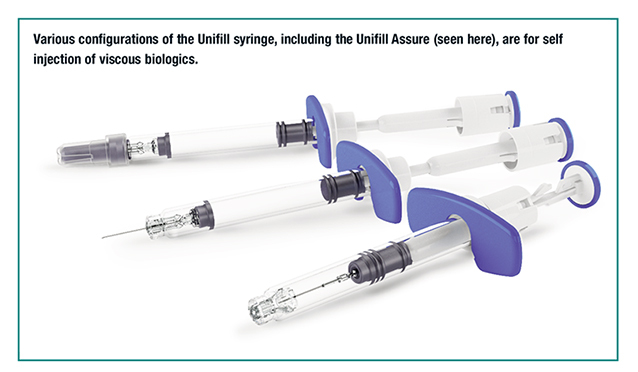 Unilife offers pharmaceutical customers a range of differentiated injectable drug delivery systems: prefilled syringes with integrated safety; disposable and smart autoinjectors with true end-of dose indicators; wearable injectors with modular features that require no terminal sterilization; dual-chamber syringes that enable ventless, orientation-free reconstitution, and minimal steps of use; and intraocular and specialized delivery systems that enhance dose accuracy and precision. “Each of these verified platforms are highly customizable and designed for seamless integration into standard filling and packaging systems with USP-compliant materials in the primary container,” says Stephen Allan, Vice President, Marketing and Communications for Unilife. Customers can select from a range of single- or multi-chamber systems with either staked or attachable needles in multiple sizes and lengths. Additionally, the EZMix dual-chamber system with simple reconstitution boasts minimal steps and automatic, integrated needle retraction. With ventless, orientation-free reconstitution, EZMix has the potential to enable or enhance the delivery of lyophilized, powder filled or liquid-liquid combination therapies. “Both Unifill and EZMix leverage an automatic and fully integrated needle retraction mechanism that allows users to control the splatter-free withdrawal of the needle directly from the body into the barrel,” explains Mr. Allan. In addition to expanding its portfolio of injectable drug delivery systems, Unilife continues to increase production capacities and its network of verified suppliers in an effort to accommodate the needs of all biologics, injectable drugs, and vaccines. “As a customer-centric, patient-centric, and outcomes-focused organization, Unilife addresses existing and emerging market needs for injectable drug delivery,” says Mr. Allan. Vetter is a contract development and manufacturing organization (CDMO) that specializes in the aseptic manufacturing of syringes, cartridges, and vials. In collaboration with customers, Vetter offers specialized resources from development and clinical supply to commercial production and life cycle management. As a CDMO, the company helps customers pair their drug with a suitable hand held drug delivery device. This past March, Vetter launched its new commercial filling line for pre-sterilized syringes. The line is built with technologies that enhance safety and maximize API yield. The capacity ranges from mid- to large volume batch sizes, with a maximum filling speed of 800 units per minute and features a reject-and-sample process; automatic spray disinfection system; fully automatic processing of single- and double-bagged tubs; restricted access barrier system (RABS); optimized routing that shortens the distances between the compounding area and filling station; and a track-and-trace system. “The line was created in part as a response to the need for more efficient, flexible filling operations that enhance safety by minimizing human contact with devices and drug,” says Mr. Soelkner. 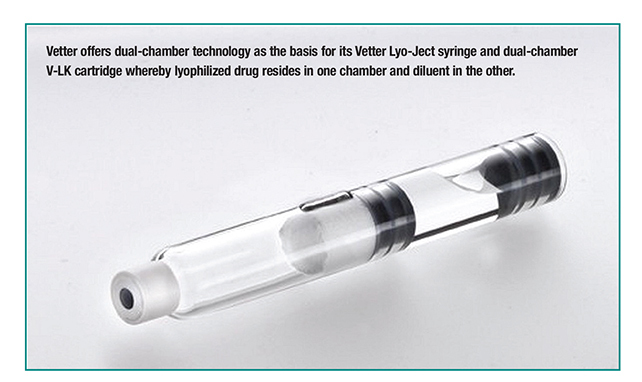 Vetter also offers dual-chamber technology as the basis for its patented Vetter Lyo-Ject syringe and dual-chamber V-LK cartridge. Lyophilized drug resides in one chamber, diluent in the other. The drug is reconstituted prior to administration. The VLK cartridge can be used with pen systems in single or multiple doses. “Dual-chamber technology provides product differentiation on the market, whether at initial launch or as part of a product lifecycle management strategy, along with market opportunity as the homecare sector grows,” he says. West has been one of the leaders in drug containment systems for hand held devices, and has supported customers with the development and manufacture of components and systems for injection devices such as insulin pens and autoinjectors. In the past few years, West has focused on collaborating with our partners, as well as developing a range of proprietary systems aimed at meeting unmet market needs. West’s focus is on those areas where repeat injections are necessary, however the company is exploring new areas where injection has not been the typical route of delivery (e.g. asthma, high cholesterol). The integration of the drug container and the device as part of a complete system has proven critical in ensuring optimal delivery system performance. 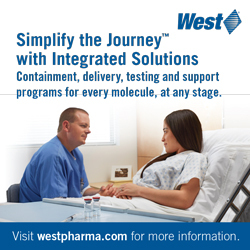 “West continues to focus on helping our partners understand and optimize the performance and interaction of four key elements of any successful drug delivery system: the drug, the container, the injection system, and the patient. If any one of these elements is not fully understood, then the overall effectiveness of drug delivery may be compromised,” says Graham Reynolds, Vice President, Marketing and Innovation, West Pharmaceutical Services. In the past year, West announced an agreement with Janssen Biotech to develop and commercialize a new self-injection technology, called the SelfDose injector system. The SelfDose injector system offers patients a user-friendly administration system, and offers pharma/biotech companies the option to use this technology with a simplified pathway to the market. The SmartDose electronic patch injector system technology has progressed to the point of validated systems capable of use in human clinical trials. 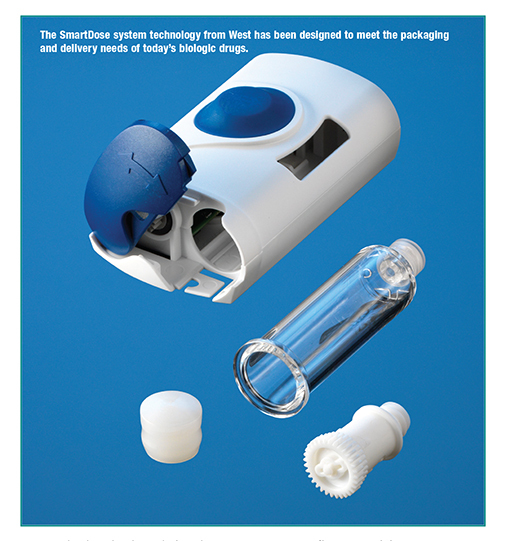 The SmartDose system technology has been designed to meet the packaging and delivery needs of today’s biologic drugs. The Crystal Zenith polymer cartridge system enables sensitive drug containment without the need for silicone oil lubrication, while dimensional precision enables effective and repeatable injection performance. Electronic capabilities within the SmartDose system allow for programmable dosing, as well as enabling user feedback and monitoring. West recently announced the receipt of a $20 million payment from a customer for exclusive access to the SmartDose system in a defined therapeutic area. “Commercialization will be in line with our customers’ timelines for their regulatory filings, but we are increasing capacity for commercial quantities,” says Mr. Reynolds. West has also moved forward with the 1.5mL ConfiDose auto-injector system technology, using a customized 1.5mL Crystal Zenith polymer syringe system. The system offers automatic injection of a single dose within a short period of time, and has been designed to be compatible with a range of syringes and viscosities. And, the SelfDose system has been advanced to the later stages of development and will be ready for clinical studies later in the year. The SelfDose injector system technology offers a simple, manually activated injection system, compatible with established prefilled syringes. It enables the user to control the rate of injection, and provides needle hiding before and after injection. It has been designed with the needs of patients in mind, particularly those suffering from rheumatoid arthritis or those with limited dexterity. Ypsomed is highly focused on self-care, specializing in making injections simple and comfortable to be taken at home. However, pharmaceutical customers have varying needs in terms of both the functionality of the injection systems and the costs, depending on the specific drug and its use, as well as the prevalent market conditions in the country concerned. The main indications for Ypsomed self- injection devices are diabetes, inflammatory diseases, growth disorders, osteoporosis, and other indications that require self-injection devices. The company has introduced several products to the market to address both the self-administrator and the pharmaceutical client. 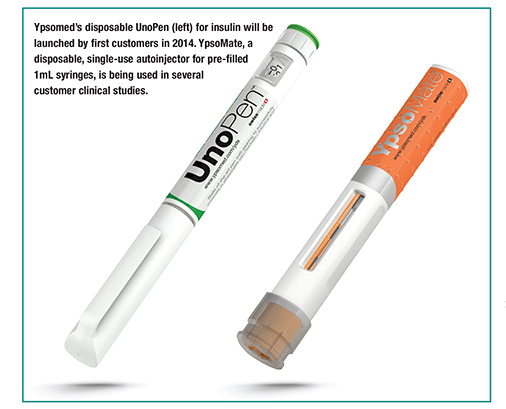 UnoPen is a disposable pen that is well-suited to insulin suppliers who are competing with the major suppliers in established markets, but it is also suitable for administering GLP-1 drugs, as well as parathyroid (PTH), growth (hGH), and fertility hormones (FSH). “The user-friendly and yet economically priced disposable pen is very well accepted by users and is an important marketing tool that allows pharmaceutical customers to clearly set themselves apart from their competitors,” says Ian Thompson, Vice President, Business Development, Ypsomed. UnoPen will be launched in 2014. Ypsomed is also in the process of industrializing YpsoMate, a disposable, single- use autoinjector for pre-filled 1mL syringes made of glass or plastic. The autoinjector is compact and ergonomic to handle. The needle is invisible to the patient, before, during and after use, making it more acceptable to patients and, therefore, resulting in better compliance. The clearly audible clicks during use and a large viewing window, through which the syringe body can be seen, increase patient confidence and safety, and provide confirmation that the full dose has been injected. “With this development, Ypsomed follows the constantly growing market for drugs in pre-filled syringes,” explains Mr. Thompson. Examples include drugs for autoimmune diseases or long-acting drugs that are administered with a fixed dose. YpsoMate is currently undergoing tests as part of several clinical studies. As a developer and marketer of its own pharmaceutical products, Zogenix also offers drug delivery technologies. In 2012, Zogenix partnered with R&D experts at Battelle to offer the DosePro instantaneous, needle-free delivery system to other pharmaceutical companies. There are two big stories that emit from the Zogenix/Battelle partnership. 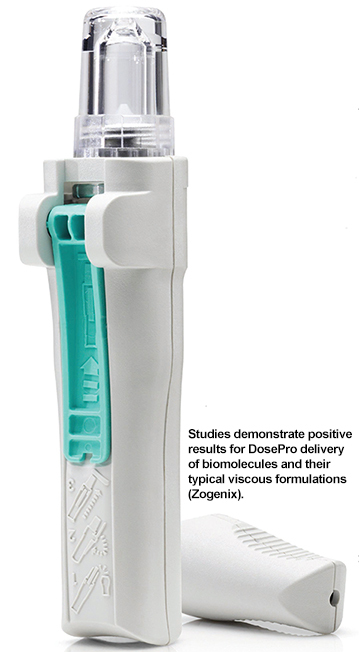 “The first is evidence confirming that the integrity of biomolecules such as monoclonal antibodies is maintained upon instantaneous, needle-free delivery via our DosePro technology,” says John Turanin, Vice President and General Manager, Zogenix Technologies. Battelle and Zogenix conducted an in vitro study showing that the integrity of Humira (AbbVie) delivery by DosePro is no different than PFS controls. In addition, MedImmune and Zogenix co-authored two posters at the AAPS National Biotechnology Conference in May 2013: The first study comparing delivery of two monoclonal antibodies by DosePro and PFS controls, and the second assessing delivery of model viscous formulations, mimicking those for mAbs. “Both of these studies demonstrate positive results for DosePro delivery of biomolecules and their typical viscous formulations,” he says. The applicability of the DosePro technology for subcutaneous delivery ranges from drugs that are small molecules to biomolecules, stable in aqueous formulation or suspension, and with a fixed dose that is a single prefilled, fixed, bolus. DosePro has achieved commercial drug status, having been approved by FDA (2009) within its first drug/device combination product, SumavelDosePro (sumatriptan for injection) and launched in 2010, followed by EU approvals in 2010. 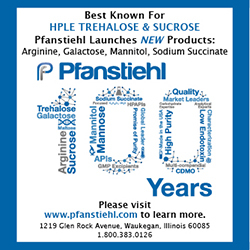 A key commercial manufacturing milestone was recently achieved with the release to market of the 2 millionth SumavelDosePro. Zogenix maintains two areas of focus. One is to ensure that biopharmaceutical companies have the opportunity to assess for themselves the application of our technology for biologics targeting autoimmune disorders such as rheumatoid arthritis. Within Battelle’s laboratories, Zogenix has established a Center of Excellence that can perform in vitro evaluations of biomolecules. The second area of focus is a technology extension program to expand the volume of the dose instantaneously delivered by the DosePro system from 0.5mL to 1mL and beyond. 1. Datamonitor, PharmaVitae Explorer, January 2012.